We’d love your help. Let us know what’s wrong with this preview of The World as I See It by Albert Einstein. To ask other readers questions about The World as I See It, please sign up. Can I find the arabic version ? 'You can have lots of heat, even more heat, super-heat, mega-heat, unlimited heat, white heat, a little heat or no heat, but we don't have anything called 'cold'. We can hit down to 458 degrees below zero, which is no heat, but we can't go any further after that. There is no such thing as cold; otherwise we would be able to go colder than the lowest -458 degrees. Every body or object is susceptible to study when it has or transmits energy, and heat is what makes a b The student begins to explain. 'You can have lots of heat, even more heat, super-heat, mega-heat, unlimited heat, white heat, a little heat or no heat, but we don't have anything called 'cold'. We can hit down to 458 degrees below zero, which is no heat, but we can't go any further after that. There is no such thing as cold; otherwise we would be able to go colder than the lowest -458 degrees. Every body or object is susceptible to study when it has or transmits energy, and heat is what makes a body or matter have or transmit energy. Absolute zero (-458 F) is the total absence of heat. "La vida me habría parecido vacía sin concentrarme en objetivos siempre inalcanzables tanto en el arte como en la investigación científica. Las banales metas de propiedad, éxito exterior y lujo me parecieron despreciables desde la juventud". تقييمي جاء بناء على التجميعة وليس بناء على أفكار وقناعات اينشتاين..
لم أر فائدة من الكتاب، وعنوانه ليس معكوسا في محتواه، ولم ألمس حضورا لأينشتاين في ما جمع من مقالات في هذا الكتاب..
بالإضافة إلى ذلك، لا ندري ما السياق الذي كتبت فيه تلك المقالات ولا تاريخ كتابتها ولا مصدرها، ثم إن بعض الصفحات تجد فيها فقرات متعددة لا تمت لبعضها البعض بصلة، ما يجعلني أتساءل: ما الفائدة فعلا من هكذا كتاب؟ علما أنه لا يستوفي ما وعد به..
الشيء الوحيد الذي عرفته من خلال الكتاب هو كون ألبرت معاديا للحرب والتسلح والعسكرة تقييمي جاء بناء على التجميعة وليس بناء على أفكار وقناعات اينشتاين.. This is a miscellaneous collection of Einstein's thoughts about life and religion, and war and peace. In this book,an interesting picture of Einstein, as man, emerges. Einstein sees reason manifesting itself in nature and that an appreciation of this reality is to experience the mysterious. It is this experience that "stands at the cradle of true art and true science" he writes. While this, along with fear, gave rise to religion, Einstein's religious attitude is all about mystery and not, as he w This is a miscellaneous collection of Einstein's thoughts about life and religion, and war and peace. 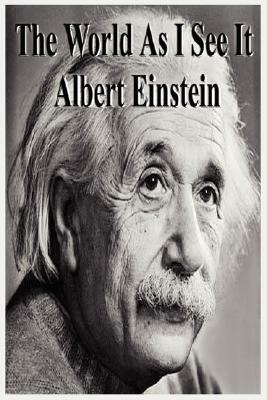 In this book,an interesting picture of Einstein, as man, emerges. Einstein sees reason manifesting itself in nature and that an appreciation of this reality is to experience the mysterious. It is this experience that "stands at the cradle of true art and true science" he writes. While this, along with fear, gave rise to religion, Einstein's religious attitude is all about mystery and not, as he writes, "the fears of an absurd egoism of feeble souls." While the scientist "is possessed by the sense of universal causation," Einstein nevertheless taps into a religious feeling that "takes the form of a rapturous amazement at the harmony of natural law, which reveals an intelligence of such superiority" that "...succeeds in keeping [the scientist] from the shackles of selfish desire." Everything we have done as a human, Einstein writes, "is concerned with satisfaction of felt needs and the assuagement of pain." While, with primitive man, fear (avoidance of pain) is the primary religious force, more civilized religions move from fear to a "moral religion" that relies on and develops social feelings, and loves and cherishes the life of the tribe or the human race, or even life as such." In the reference to life itself, Einstein elsewhere seems to value not the tribe or humans per se, but the "life of all creation." Beyond fear- and moral-based religions, Einstein sees a "third state of religious experience" where science and religion are not opposed. Science feeds into and supports "a cosmic religious feeling" that is seen in Buddhism, "as we have learnt from the wonderful writings of Schopenhauer." Philosophically, Einstein is focused on the freedom of individuals to develop as creative personalities. Fitting into this picture of life is his recognition of the variability of human nature. "Nature distributes her gifts variously among her children," he states. Accordingly, he is skeptical of state power that interferes with individual freedom. Einstein sees the world from the perspective of the whole where all forms of egoism and its social cousins of tribalism, classicism and nationalism are kept in check. Happiness in a social context comes, he says, "through renunciation and self-limitation everywhere." Although only vaguely stated, this need to check the power of the part in deference to the good of the whole appears to be for Einstein a law of reason. Reflecting on this philosophical position, Einstein is also fairly clear that he divides life up between the forces of evil (money, greed, egoism) and the forces of good where "great and pure characters" produce "fine ideas." Money appeals to selfishness and abuse. On this latter point, he asks, "can anyone imagine Moses, Jesus or Gandhi armed with the money-bags of Carnegie?" Also scattered throughout these writings are Einstein's negative comments about war-like attitudes of state power and what he saw occurring in Germany. The exchanges he had with the Prussian Academy of Science regarding his resignation is particularly striking. Here and there, Einstein also makes practical suggestions to counter the abuses of state power. We exist for our fellow man... Our actions and desires are bound up with the existence of other human beings - "We eat food that others have grown, wear clothes that others have made, live in houses that others have built. The greater part of our knowledge and beliefs has been communicated to us by other people through the medium of a language which others have created." "I want to research, not to teach. There is too much education all together... the only rational way of educating is to be an e We exist for our fellow man... Our actions and desires are bound up with the existence of other human beings - "We eat food that others have grown, wear clothes that others have made, live in houses that others have built. The greater part of our knowledge and beliefs has been communicated to us by other people through the medium of a language which others have created." "I want to research, not to teach. There is too much education all together... the only rational way of educating is to be an example." Mình cứ nghĩ Einstein suốt ngày nghiên cứu này nọ chứ! Ai dè ông cũng là con người nhân văn, cũng rất có trách nhiệm với cộng đồng xã hội, viết báo bày tỏ quan điểm về các vấn đề xã hội, phê phán cái sai, cổ vũ cái tốt, viết thư an ủi động viên người quen cũng như người không quen biết. Và cuối cùng tuy ông là một nhà khoa học lớn nhưng ông cũng có tinh thần tôn giáo cao và đặc biệt mang trong mình tình yêu tự do hòa bình. Đọc cuốn sách, thấy được một số quan điểm của Einstein về cuộc đời, ông là một người yêu chuộng hoà bình, ghét chiến tranh, thích cuộc sống bình dị, ghét vật chất cũng như danh tiếng, ghét cuộc sống đua tranh vụ lợi mà chỉ muốn cống hiến hết mình. Çok şaşkınım. Yaşadığı dönem, Almanya'nın içinde bulunduğu durum, dünya savaşı gibi etkenlerden dolayı herhalde etkilenilmiştir diye düşünüyorum. Daha doğrusu düşünmek istiyorum. Bir bilim insanı bu kadar taraflı bu kadar tek düze düşünebilir mi? Özellikle Amerika ile ilgili yüceltmeleri, Almanya ve Almanlar ile ilgili düşünceleri oldukça taraflı, objektiflikten uzak. Daha kötüsü ise din konusunda bu kadar bağnaz bir bakış açısı ve tek taraflı yüceltme, inanılmaz. Bir bilim insanının din ile ala Çok şaşkınım. Yaşadığı dönem, Almanya'nın içinde bulunduğu durum, dünya savaşı gibi etkenlerden dolayı herhalde etkilenilmiştir diye düşünüyorum. Daha doğrusu düşünmek istiyorum. Bir bilim insanı bu kadar taraflı bu kadar tek düze düşünebilir mi? Özellikle Amerika ile ilgili yüceltmeleri, Almanya ve Almanlar ile ilgili düşünceleri oldukça taraflı, objektiflikten uzak. Daha kötüsü ise din konusunda bu kadar bağnaz bir bakış açısı ve tek taraflı yüceltme, inanılmaz. Bir bilim insanının din ile alakası olur mu olmaz mı ayrı konu ama bu biçimde bir bakış açısı olması bana göre doğru eksininde değil. Filistin'de yaşananları yapılanma, yapılan zulümlerin görülmeden "yahudilerin toplanması" olarak değerlendirmesi, yapılan katliamları görmemesi mi yoksa görmek istememesi mi anlayamadım. Birebir aynısını Almanya'da gören biri olarak bunu nasıl gözardı edebilmiş anlayamıyorum. Dahası ise eleştirdiği sistem ile kendi söylediklerinin ve övdüğü Amerika'nın sürekli olarak çelişmesi akıl alır şey değil. مجموعة مقالات ورسائل جُمعت في هذا الكتاب، تتحدث عن الدين والسياسة والمجتمع بطريقة فلسفية، لم أفهم بعض المواضيع كونها أحداث وقعت في بدايات القرن العشرين في ألمانيا ودول أوروبا. السعي وراء العلم من أجل العلم، وحبُّ العدالة، والرغبة في الإستقلال من سِمات اليهود المُميّزة والتي تجعلني أفتخر بأني يهودي. ما شدّني في هذا الكتاب، حديث آينشتاين عن اليهود والعرب وخاصة عن موضوع إنشاء دولة إسرائيل. من المعروف أن حكومة إسرائيل قد عرضت على آينشتاين منصب رئيس وزر مجموعة مقالات ورسائل جُمعت في هذا الكتاب، تتحدث عن الدين والسياسة والمجتمع بطريقة فلسفية، لم أفهم بعض المواضيع كونها أحداث وقعت في بدايات القرن العشرين في ألمانيا ودول أوروبا. ما شدّني في هذا الكتاب، حديث آينشتاين عن اليهود والعرب وخاصة عن موضوع إنشاء دولة إسرائيل. من المعروف أن حكومة إسرائيل قد عرضت على آينشتاين منصب رئيس وزراء إسرائيل لكنه رفض، وفضّل البقاء بعيدا عن السياسة. يبدو أن آينشتاين في مقالاته ورسائله كان مشجّعاً لإقامة دولة لليهود في فلسطين، بل ومشجّعاً للحركة الصهيونية.فقد حثّ في كتابه هذا على إنشاء علاقات صداقة مع العرب والتعايش معهم بسلام لإنشاء حركة صهيونية دون أية عوائق. По времето, когато излиза тази книга, Айнщайн е изключително популярен учен, но не е още пророкът на атомната ера – и затова и може да си позволи чудесна прямота, хумор и дори малко арогантност. Например по темата за едно женско движение, което протестира срещу идването му в САЩ, той сравнява техните вопли с гъските, които едно време са спасили Рим – определено аналогия, която в днешно време би изяла кариерата на всяка публична личност там. Всъщност текстовете в сборника са най-различни по призход, основно писма до приятели и познати, дори надгробни слова. نخبة المقالات لأينشتاين .. هكذا يُقال ! . بعد قراءتي للكتاب شعرت بأنني قرأت " الفراغ " . هذه المقالات والأقوال بلا تاريخ بلا مرجع ..لا تعرف المناسبة التي كتبت و ذكرت فيها ، توجد عشوائية في الكتاب و كلام لا مغزى له فتجد في الفقرة الواحدة عدة موضوعات لا تمت بصلة لبعضها البعض ! . عادا عن هذه كله ، ماذا استفدت من هذا الكتاب ؟ ، الجواب : لا شيء .. أو كما ذكرت سابقًا " الفراغ " . توقعته كتاب رائع لكن مع الأسف هذا كتاب لا طائل منه . What did Albert Einstein think about religion, war and the military, and Zionism? Although Einstein was not religious he was very committed to Jewishness as a culture. He was clearly antiwar and opposed to any standing armies. I thought the book would've been much more interesting if his writings would've been more clearly placed in their historic context and at least consistently dated. Einstein was much more than a brilliant physicist. «یک متخصص فیزیک کوانتوم همان قدر دل‌مشغولی فلسفی دارد که یک متخصص مکانیک گاراژ». با اذعان به صحت این مطلب٬ سردرآوردن از نظرات فلسفی ساینتیست‌ها و درواقع فهمیدن آنچه پشت پیشانی می‌پرورانند خیلی برام جذاب بوده و هست. سراغ این کتاب رفتم چون بعد از نگاهی گذرا به فهرست به وجد اومدم‌. ولی در واقع این کتاب مجموع مکاتبات و سخنرانی‌های این دانشمند کاریزماتیک‌ه. در مورد دلایل کاریزماتیک بودن اینشتین یحتمل باید چهره‌ی خاص٬ علاقه‌مند به مشکلات جهان و «easygoing» بودن‌ش رو به عنوان یک چهره‌ی برتر علمی نام ببرید. این کتاب توامان خنده٬ تأسف و گاهی عصبانیت من رو برانگیخت‌. وقتی اینشتین از تشکیل سازمان بی‌طرف جهانی صحبت می کنه و اون رو تنها راه به صلح رسیدن می‌دونه و یا آمریکا رو گاهی مظهر صلح جهانی و تمام خوبی‌ها می‌دونه٬ این پیش‌بینی‌ها و خوش‌بینی ‌های غلط از آب دراومده من رو به خنده و گاهی تأسف واداشت. از طرفی اینشتین را شخصیتی پر از تناقض یافتم٬ وقتی از نابودی مرزها و از بین رفتن حس ناسیونالیستی و صلح حرف می‌زنه و تمام قد از تشکیل حکومت مرکزی یهود و تشکیل دولت اسرائیل در فلسطین دفاع می‌کنه و با افتخار خودش رو صهیونیست معرفی می‌کنه. و یا زمانی مذهب رو زاییده‌ی ترس می‌دونه و یهودیت رو یگانه منشا الهام بخش احساسات خوب‌. این موضوعات به علم مربوط نیستند و ما باید متوجه این موضوع باشیم‌. در قله‌ی علم بودن الزاما به معنای «وحی منزل» بودن سخنان نیست. خیلی جدی‌تر بین چهره‌ی علمی و اجتماعی اینشتین تفکیک قائلم. هذا الكتاب عبارة عن مجموعة قصاصات منتقاة بعناية من مقالات ، وخطب ورسائل وتصريحات ل-ألبرت آينشتاين في مناسبات مختلفة- الغرض منها إلقاء الضوء على شخصيته الإنسانية الفكرية و معتقداته وآرائه تجاه العالم، الحياة، الإنسان، الدين،السياسة، الحرب والعلم وغيره. ( الدين الكوني). عاش مدافعاً عن أفكار العدالة والحرية.
" إن التوق الشديد للحب، العون و هذا الكتاب عبارة عن مجموعة قصاصات منتقاة بعناية من مقالات ، وخطب ورسائل وتصريحات ل-ألبرت آينشتاين في مناسبات مختلفة- الغرض منها إلقاء الضوء على شخصيته الإنسانية الفكرية و معتقداته وآرائه تجاه العالم، الحياة، الإنسان، الدين،السياسة، الحرب والعلم وغيره.
" إن التوق الشديد للحب، العون والمساعدة، للقيادة هي عواطف تستدعي إيجاد فكرة الإله الاجتماعي، الأخلاقي ." " في عصرنا المكرس عامة للمادية يظل العلماء الجادون هم أكثر البشر ديناً"!! لكاتبٍ ما. كانت له جهود ومحاولات حثيثة ل- إرساء السلام والسلم العالمي ووقف الحروب ونزع السلاح- تبعها تسجيل مواقف جادة ك- استقالته من أكاديمية العلوم - وكذا أكاديمية العلوم البروسية- ولا ننسى مواقفه الجادة كذلك ضد الفاشية ومعاداة السامية/ اليهود .
" الإنسان هو القيمة الأثمن للبشرية، أخجل من تردادها لو لم تكن مهددة بالوقوع في غياهب النسيان، خاصة في زمننا الطافح بالنظم والكلام المعاد." "إن الشخصيات المستقلة، والتي تتشبث بفردانيتها كما هو الحال لدى العلماء لا تنحني طوعاً أمام إرادة خارجية عنها، ولا تتصرف إلا بما يملي عليها عواطفها النابعة من القلب بالذات"
يرى أن تحرر واعتزال الفرد النسبيّ ساهم في بناء وتشييد الحضارة؛ فالمجتمع السليم مرتبط باستقلالية أفراده. كما أشار إلى أهمية التربية العقلية. تحدث عن بعض العقول النيرة ك- آرنولد بيرلينير وكيف كافح وساهم في رسم طريق ورؤيا واضحة وشمولية في بحثه العلمي الجاد؛ اهتدى به الكثير من العقول وتحت أشكال حية في المسائل والمناهج، ونتائج العلم. كما وصف برنارد شو بأنه ساحر العقول. يرى بأن الفن والعلم هما المخلصان الحقيقيان للإنسان والإنسانية وهما الدعامة التي تبنى بها الحضارات المتينة. أينشتاين متحدث رائع ، كما أنه يمتلك الحس الأدبي والذي تلمسه من خلال خطابه ورسائله. لابد من الإشارة انه ورد في الكتاب على لسان أينشتاين أنه أحد الأوفياء والمخلصين ل- فكرة الصهيونية ولا بد من توضيح أنه تراجع وعدل عن موقفه منها فيما بعد . در ابتدا که شروع به خواندن کتاب میکنید، پراکندگی مطالب عجیب به نظر می رسد! این از آن بابت است که نویسنده، نامهها و متن سخنرانیهایش را در قالب کتابی گرچه با دستهبندی هایی مشخص گرد هم آورده است. اما اگر ندانی که چطور میتوانی از این نوشتهها بهره ببری، زود خسته میشوی. این اتفاقی بود که برای من افتاد. اما به مرور متوجه شدم که با خواندن فصل اول، میتوانم با نگرش و سیستم باورهای فلسفی نویسنده آشنا شوم و در فصول بعدی ردپای وقایع تاریخی و سیاسی را در نامههای او ببینم. حدس میزنم ترجمهای که در دست من است، او در ابتدا که شروع به خواندن کتاب می‌کنید، پراکندگی مطالب عجیب به نظر می رسد! این از آن بابت است که نویسنده، نامه‌ها و متن سخنرانی‌هایش را در قالب کتابی گرچه با دسته‌بندی هایی مشخص گرد هم آورده است. اما اگر ندانی که چطور می‌توانی از این نوشته‌ها بهره ببری، زود خسته می‌شوی. این اتفاقی بود که برای من افتاد. اما به مرور متوجه شدم که با خواندن فصل اول، می‌توانم با نگرش و سیستم باورهای فلسفی نویسنده آشنا شوم و در فصول بعدی ردپای وقایع تاریخی و سیاسی را در نامه‌های او ببینم. The other day I read an article titled We Believe in Experts Because They Agree with Us. That might be why I like Einstein and subsequently this book. What I knew of the man behind that iconic frizzy haired picture prior to reading this came from scattered quotes of his I read somewhere or heard from friends. There was eccentricity that drew me in first and then the refreshingly grounded feel one sensed about him that spurred on my fascination about this scientist. This book is a collection of his The other day I read an article titled We Believe in Experts Because They Agree with Us. This book is a collection of his essays, letters and speeches - minus anything scientific, which I was told was present in the previous edition. I'm not sure about the other editions but mine has no timeline to it that, while I believe them to be chronological, it would have been better if there had been a context of what was going on with the world. Halfway through, however, Einstein spoke about pacifism and later, Disarmament Conference in 1932 so at least the succeeding texts have a firmer setting to them. He who [...] can no longer wonder, no longer feel amazement, is as good as dead, a snuffed out candle. There was talk about science and art and how they stemmed from the same root; comments on painting and music, expression of admiration toward people who he had come to know. Einstein talked about religion and how people see God; he advocate against war and valiantly promote pacifism. This abridged edition of letters, speeches and thoughts aims to paint a picture of Einstein as a humanistic and political commentator, philosopher and activist. I felt that the extracts should have been dated; I find the de-contextualisation very annoying and patronising. I was surprised by Einstein's conservatism on issues of education, culture and sexism, matching his scientific conservatism. He is particularly luminous and impressive in his addresses to and about Jews and Jewishness, and the v This abridged edition of letters, speeches and thoughts aims to paint a picture of Einstein as a humanistic and political commentator, philosopher and activist. I felt that the extracts should have been dated; I find the de-contextualisation very annoying and patronising. I was surprised by Einstein's conservatism on issues of education, culture and sexism, matching his scientific conservatism. He is particularly luminous and impressive in his addresses to and about Jews and Jewishness, and the visionary project to build a centre for Jews in Palestine. Trước đây mình từng thắc mắc là tại sao ngày xưa người ta thi quan văn chỉ có viết thôi? nếu so với thời bây giờ, mảng học tự nhiên ~ xã hội phân chia ra, thì ở thời đại ngày xưa đó những người có xu hướng tự nhiên phải làm sao. Oh, những người giỏi thì họ sẽ giỏi ở mọi lĩnh vực và văn của họ, suy nghĩ, tư tưởng thì cực kỳ sắc. Những bài phát biểu đầy thẳng thắn, bạo dạn và thực tiễn về khoa học, chính trị, tôn giáo, kinh tế, triết học lẫn giáo dục. Không chỉ là một thiên tài khoa học lỗi lạc, những kiến thức của ông về các lĩnh vực trên (mặc dù Einstein tự nhận là bản thân mình chỉ biết khá ít) để đưa ra quan điểm nhìn nhận thật đáng kinh ngạc với một trái tim giàu lòng yêu thương đối với nhân loại. Thật sự rất đáng đọc! By this collection of essays, letters and articles Albert Einstein sought in 1934 introduced himself to the world beyond academia and the headlines. Though he was then fifty years old, the Einstein we find here brims with youthful hope and enthusiasm. Of Jewish linage, he was an agnostic, socialist pacifist (those labels seem inadequate). Of particular interest to readers today is how some of his ideals seem current while others are so out-of-date as to seem quaint. 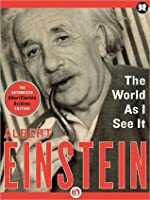 “The man who regards his own By this collection of essays, letters and articles Albert Einstein sought in 1934 introduced himself to the world beyond academia and the headlines. Though he was then fifty years old, the Einstein we find here brims with youthful hope and enthusiasm. Of Jewish linage, he was an agnostic, socialist pacifist (those labels seem inadequate). Of particular interest to readers today is how some of his ideals seem current while others are so out-of-date as to seem quaint. “The man who regards his own life and that of his fellow-creatures as meaningless is not merely unfortunate but almost disqualified for life.” “We exist for our fellow men.” He didn’t believe in God, but admitted to a “cosmic religious feeling” which maintained was “the strongest and noblest incitement to scientific research.” He opposed nationalism but was a Zionist. He hoped that reasonable men could step beyond nationalism and achieve world peace. He renounced his German citizenship in 1933 upon Adolf Hitler’s rise to power. This small volume contains many nuggets of wisdom and not a few chuckles for the reader with the benefit of eighty years of hindsight. Unfortunately, this volume omits “essays by Einstein on relativity and cognate subject” because the editors fear readers unable to understand them. Some of his views changed a lot in the following decade. World War Two did that to lots of folks. The preface provides scattered contexts for the essays to follow, but that was no way to inform the reader. By the time I reached the end of the book, I forgot all the information that was condensed in the preface. The book should have organized essays/letters by theme in a chronological fashion, and offered an introduction for each one of them. Some letters could easily be disregarded. For instance, I don't see any interest in reading the exchange that took place between Einstein and the Academy. The preface provides scattered contexts for the essays to follow, but that was no way to inform the reader. By the time I reached the end of the book, I forgot all the information that was condensed in the preface. Some letters could easily be disregarded. For instance, I don't see any interest in reading the exchange that took place between Einstein and the Academy. I find it paradoxical that Einstein "played a key role in America's development of atomic weapons", and was a pacifist who strongly advocated disarmament. Were these two different phases that didn't overlap? I do not see any insight in his religious/spiritual views. It's just a single man's personal stand on faith. Einstein was understandably a strong devotee of Zionism as a social and cultural idea. What shocked me is that he referred to Palestine as a "colonial enterprise" and mentioned "the scheme of colonizing Palestine". In 1879, Albert Einstein was born in Ulm, Germany. He completed his Ph.D. at the University of Zurich by 1909. His 1905 paper explaining the photoelectric effect, the basis of electronics, earned him the Nobel Prize in 1921. His first paper on Special Relativity Theory, also published in 1905, changed the world. After the rise of the Nazi party, Einstein made Princeton his permanent home, becoming In 1879, Albert Einstein was born in Ulm, Germany. He completed his Ph.D. at the University of Zurich by 1909. His 1905 paper explaining the photoelectric effect, the basis of electronics, earned him the Nobel Prize in 1921. His first paper on Special Relativity Theory, also published in 1905, changed the world. After the rise of the Nazi party, Einstein made Princeton his permanent home, becoming a U.S. citizen in 1940. Einstein, a pacifist during World War I, stayed a firm proponent of social justice and responsibility. He chaired the Emergency Committee of Atomic Scientists, which organized to alert the public to the dangers of atomic warfare. At a symposium, he advised: "In their struggle for the ethical good, teachers of religion must have the stature to give up the doctrine of a personal God, that is, give up that source of fear and hope which in the past placed such vast power in the hands of priests. In their labors they will have to avail themselves of those forces which are capable of cultivating the Good, the True, and the Beautiful in humanity itself. This is, to be sure a more difficult but an incomparably more worthy task . . . " ("Science, Philosophy and Religion, A Symposium," published by the Conference on Science, Philosophy and Religion in their Relation to the Democratic Way of Life, Inc., New York, 1941). In a letter to philosopher Eric Gutkind, dated Jan. 3, 1954, Einstein stated: "The word god is for me nothing more than the expression and product of human weaknesses, the Bible a collection of honorable, but still primitive legends which are nevertheless pretty childish. No interpretation no matter how subtle can (for me) change this," (The Guardian, "Childish superstition: Einstein's letter makes view of religion relatively clear," by James Randerson, May 13, 2008). D. 1955. While best known for his mass–energy equivalence formula E = mc2 (which has been dubbed "the world's most famous equation"), he received the 1921 Nobel Prize in Physics "for his services to theoretical physics, and especially for his discovery of the law of the photoelectric effect". The latter was pivotal in establishing quantum theory. Einstein thought that Newtonion mechanics was no longer enough to reconcile the laws of classical mechanics with the laws of the electromagnetic field. This led to the development of his special theory of relativity. He realized, however, that the principle of relativity could also be extended to gravitational fields, and with his subsequent theory of gravitation in 1916, he published a paper on the general theory of relativity. He continued to deal with problems of statistical mechanics and quantum theory, which led to his explanations of particle theory and the motion of molecules. He also investigated the thermal properties of light which laid the foundation of the photon theory of light. He was visiting the United States when Adolf Hitler came to power in 1933 and did not go back to Germany. On the eve of World War II, he endorsed a letter to President Franklin D. Roosevelt alerting him to the potential development of "extremely powerful bombs of a new type" and recommending that the U.S. begin similar research. This eventually led to what would become the Manhattan Project. Einstein supported defending the Allied forces, but largely denounced the idea of using the newly discovered nuclear fission as a weapon. Later, with Bertrand Russell, Einstein signed the Russell–Einstein Manifesto, which highlighted the danger of nuclear weapons. Einstein was affiliated with the Institute for Advanced Study in Princeton, New Jersey, until his death in 1955.